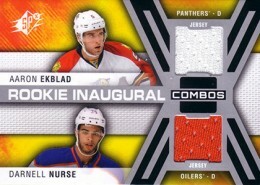 2014-15 SPx Hockey brings some flash to go with a handful of promised hits. Every box has four total autographs, memorabilia cards or premium inserts. There’s also a vibe from the past with 1997-98 SPx Retro inserts. 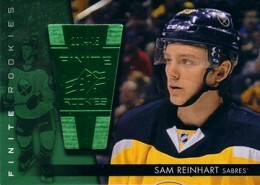 Joining the 100-card base set are Spectrum Light F/X Rookie Autographs. Done in a style similar to PMG inserts, each is available in three colors. Red are the basic versions and come numbered to 249. Rookie Autographed Jerseys are numbered to 499 (Level 1) and 249 (Level 2). Blue parallels are numbered to 50 and Green are limited to 10 copies each. All Spectrum Light F/X Rookie Autographs combine to land one per box. Other hits should sound familiar to most collectors who have bought SPx in the past. 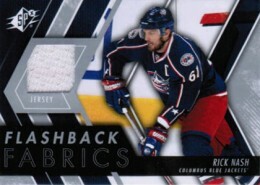 Flashback Fabrics (1:48 packs) return along with Patch versions numbered to 25. 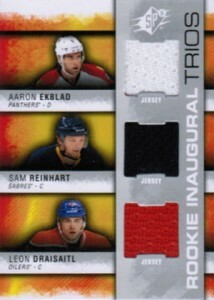 Rookie Premiere Materials come with anywhere from one to three swatches or patch pieces. 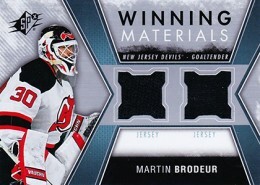 Winning Materials also return with basic and Combo versions. 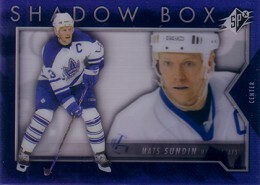 Shadow Box (1:192) are some of the toughest cards in the product. Even though they don’t all have autographs, they do come with a premium look and feel. While basic versions aren’t signed, there are Shadow Box Signatures (1:3,123) and Shadow Box Rookie Signatures (1:1,562). Heading back to the early days of SPx are 1997-98 SPx Retro inserts. 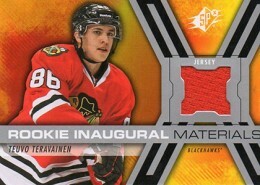 Based on the brand’s second foray on the ice, veterans are inserted 1:3 packs. Rookies are 1:6 packs. Both have thick Grand Finale parallels numbered to 50. 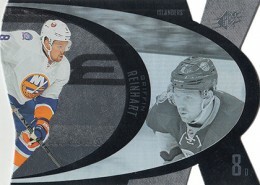 Rounding out the inserts are SPx Foil Rookies. These have Gold Autograph versions numbered to 99 as well. 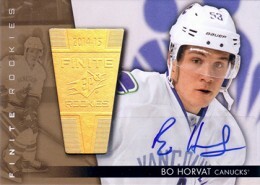 Every box of 2014-15 SPx Hockey comes with a bonus pack as a box topper. Each has an exclusive SPx Finite Phenoms rookie. These are available in three levels numbered to 499, 199 and 99. Autographed versions are also randomly inserted. 8 cards. Serial Numbered #/199. This is my first year that I re-begin collection hockey card and I can say that after buying two boxes of 14-15 Series ones and two boxes of 14-15 Artifact the 14-15 SPx boxes are my far the product that I enjoy the most. Please…I want the abundance of rookie parallels to stop. Not a fan of this set or Trilogy…you really have to knock it out of the park for the investment. 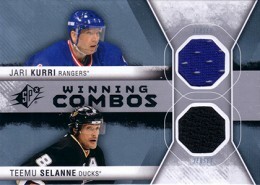 Just do yourself a favor; have a peek at the cards selling from this set on ebay..
My favorite collection! 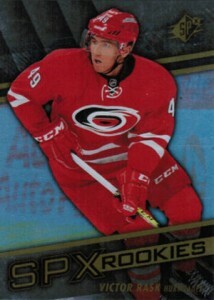 very nice cards and alot of rookies, I almost have ALL of them!! 2014-15 SPx Factory Sealed Hockey Hobby Box Wayne Gretzky Shadowbox AUTO ?? ?